The Villa La Roche is a perfect showcase for Le Corbusier's new architecture, designed for a Swiss banker and collector of avant-garde art. 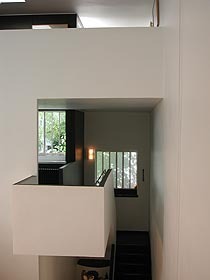 The whole house is the art gallery, an 'architectural promenade' - a theme inspired by Le Corbusier's visit to the Acropolis in 1911 and repeated most strikingly in his Carpenter Center for the Visual Arts nearly forty years later. 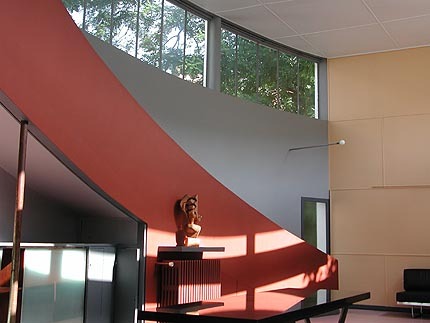 ...Catch your breath, turn around, and proceed to the culmination, La Roche's curved gallery... [M]ount the brown ramp to the left, to Le Roche's aerie, his top-lit library. 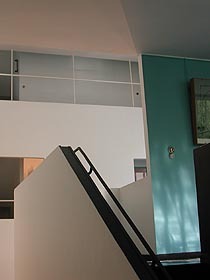 The spatial sequence is remarkable and remained a constant preoccupation of Le Corbusier. It also became the stock in trade of subsequent Modern architects. The Villa La Roche has recently been thoroughly restored and can now be seen in pristine condition - the bright white surfaces and the blues, reds and blacks. 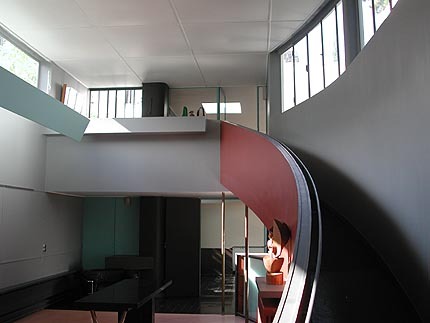 The villa is open to the public, administered by the Fondation Le Corbusier, which is based in the adjoining Villa Jeanneret at 8 square du Docteur-Blanche. 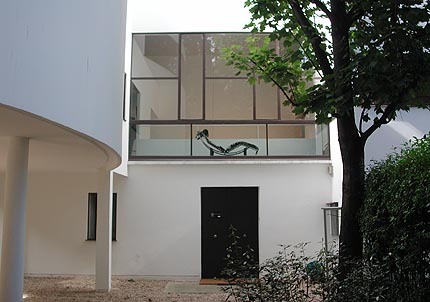 For visiting hours please call +33 1 42 88 41 53 or visit www.fondationlecorbusier.asso.fr. The villa is ten minutes' walk west of Jasmin metro station on Line 9. From the metro station follow rue Jasmin (direction south-west) to the end, turn right onto rue Raffet, then right again onto rue du Docteur Blanche. Square du Docteur-Blance is a private square behind wrought iron gates shortly on your right, with the Villa La Roche at the end (and the Villa Jeanneret on your right just before it).